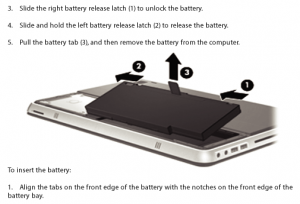 Unlike Toshiba, HP, Dell, and Lenovo publish their repair manuals online, for anyone to use. HP Manual pictured. Anyone who has spent any time following the e-waste issue will recognize that it’s better if we can make our electronic products last longer instead of just trashing them when we don’t want them any longer. It’s even better than recycling. A significant amount of the earth’s precious resources, including metals, energy and water, goes into making each new computer, phone, or television. So while recycling is good, repairing or refurbishing a product for a second owner to use is even better.The best champions of reuse in this country are the hundreds of (mostly small) non-profits who divert products from the landfill or shredder bin, and refurbish them for new owners. Just as important is the huge network of devoted “geeks” who have never met a gadget they can’t fix, and who crusade (often in their spare time) for others to fix their own stuff by making the repair information and parts very easily accessible to everyone, for free. One such group, based in the U.S. is iFIXIT, which posts free, easy-to-follow repair instructions on a whole range of products, and encourages kids and novices to jump into the Fix-It-Yourself waters and have a swim. Dell and HP post their manuals, why not Toshiba? 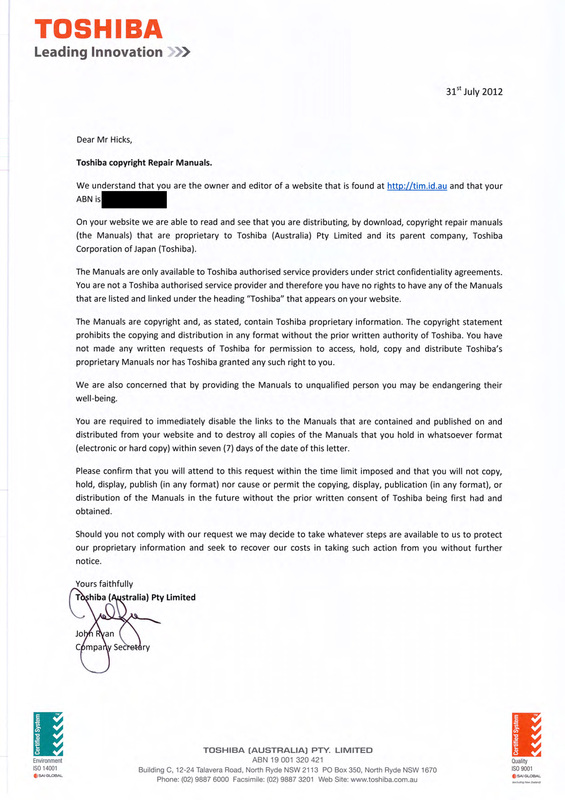 But when one such devoted repair geek in Australia, Tim Hicks, posted Toshiba’s computer manuals on his website, he got a cease and desist letter from Toshiba, saying it was proprietary information. According to a piece in Wired magazine, Tim’s site is used by a lot of non-profits and service technicians alike (for free, of course). But now they will no longer have access to his Toshiba manuals, which he has had to take down. Every product has a repair manual, which the companies supply to their own authorized repair vendors. While they are copyrighted, many companies don’t enforce the copyright. Any repair guy will tell you that it helps them to their jobs when the manufacturers of the products make their own repair manuals available online, for everyone to use. Dell and HP both do this – with photos to make them even easier. Lenovo does this for some products. Apple, like Toshiba, will have their lawyers send you a letter if you post their repair manual online. Technically, Toshiba has the right to enforce their copyright. But consider the bigger picture here. Toshiba (along with every one of its competitors in the industry) follows the planned obsolescence business model, where they make money by constantly selling us new stuff, not by getting us to hang onto our old stuff longer. Using the official manufacturer repair depots is often expensive, and not always convenient (it’s common to have to ship the product off for repairs). So companies that only offer that option (and don’t empower other repair options) are, in effect, creating an obstacle to reuse and repair of their products. It’s bad enough that manufacturers like Toshiba don’t design their products the be significantly upgradeable and long lasting; the least they could do is to make it easy for people to find out how to fix them to get a little more use out of them. Come on, Toshiba. Show us that you actually mean the words in your Environment Vision 2050 statement, and publish your repair manuals on your own website, enabling people all over the world, who want to keep using your products, to easily do so. Really, you should consider this an endorsement of your products that people think they are worth fixing and refurbishing.